INKA Entworks' PallyCon is a cloud-based SaaS which provides multi-DRM and forensic watermarking for online media services. It is built on AWS and pre-integrated with many media workflow products such as encoder/transcoder, streaming servers, CDNs, and client players. 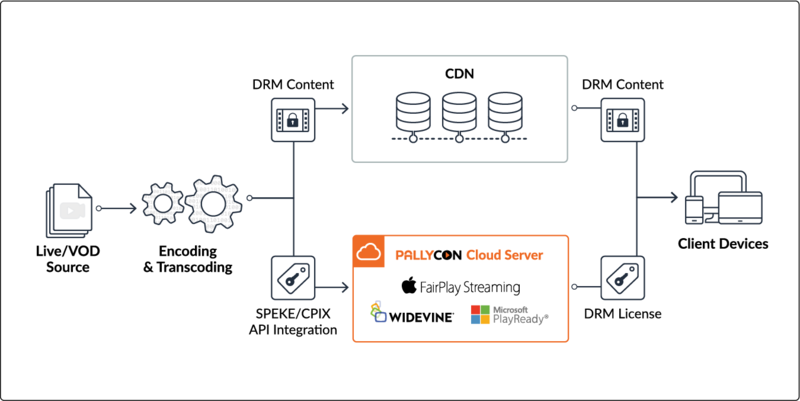 PallyCon Multi-DRM service provides content key management and license issuance for Microsoft PlayReady, Google Widevine, Apple FairPlay Streaming and NCG (Netsync Content Guard) DRM. It is integrated with AWS Elemental via the Secure Packager and Encoder Key Exchange (SPEKE) API, supporting the DRM content packaging by AWS Elemental MediaConvert, AWS Elemental MediaPackage, AWS Elemental Live, and AWS Elemental Delta. PallyCon Multi-DRM also supports DASH-IF Content Protection Information Exchange Format (CPIX) API which enables the integration with Anevia, Flussonic, and other encoder/transcoder solutions. PallyCon Forensic Watermarking is a cloud-native video watermarking service which can add invisible watermark in the video stream and track illegal distribution of the content. It is robust against various attacks including re-encoding, cropping, filtering and camcording. PallyCon Forensic Watermarking supports compliance with MovieLabs' Specification for Enhanced Content Protection. It is approved by Hollywood studios for premium movie content. 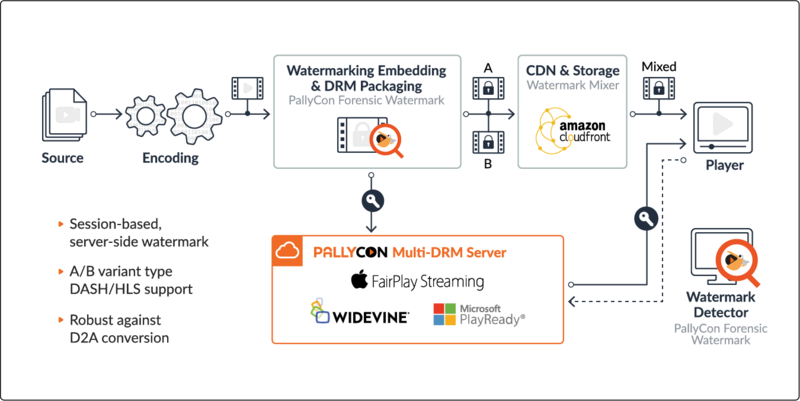 With both PallyCon Multi-DRM and Forensic Watermarking services, video service operators can easily apply an end-to-end content security workflow with affordable pay-as-you-go pricing. PallyCon product is also available on AWS Marketplace to allow one-stop payment for your AWS-based media workflow. Get started with PallyCon for free? PallyCon Forensic Watermarking and Multi-DRM are free to try and Easy to set up!